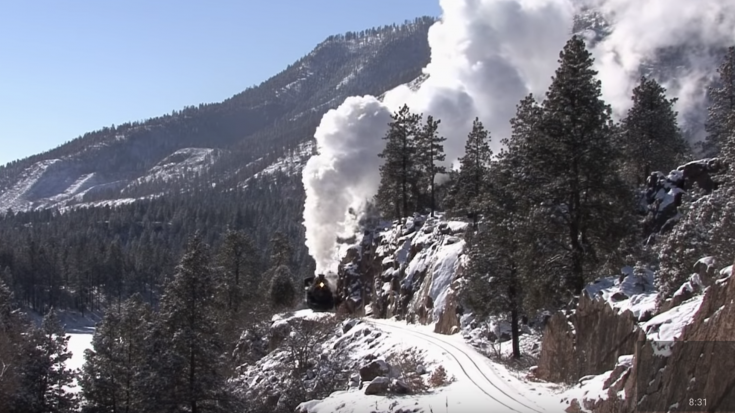 Durango & Silverton #481 releases her steam in the cold Colorado air ! The Denver and Rio Grand Western Railway is a 3 foot narrow gauge railroad that dates back 1870 and originally ran south from Denver. The railway acted a bridge line on the transcontinental railroad and connected Salt Lake City and Denver. D&GRW railroad was known as the highest main line in the United States topping out 10,240 feet altitude through the Tennessee Pass in order to connect the mining towns of Aspen, Colorado. The Durango and Silverton Railroad has 3 K-28 Class 2-8-2 Mikado type locomotives. Although less powerful than their K-36 cousins, these smaller locomotives were preferred by engineers because of their design and balance. Judging from the terrain that these locomotives needed to traverse, you can see why. Let us know if you have had the chance to take this scenic excursion on the Durango & Silverton Railroad! We would love to hear about your experience!